As relating to the quality of the cement paste while in a plastic state, from screeding through floating and final trowelling. A surface which has low finishability may have an inadequate amount of portland cement paste, a high water:cement (w/c) ratio or too high a flyash or slag replacement which can lead to premature surface drying, cracking, bumpy tolerances and delaminations. When concrete mixes are developed for a project, they must also be designed for finishability (ref: CSA A23.1 Clause 4.1.2.1). A process of texturing a concrete surface to resemble brick, stone, wood, tile or a variety of other traditional finishes in the surface of a concrete pavement or floor. 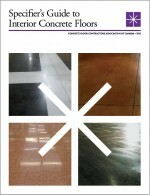 Imprinted concrete may be natural or pigmented. A concrete floor finish for new or old concrete surfaces obtained through the application of a silicate based liquid densifier as specified by the manufacturer. These liquid hardeners react chemically with the hydrated cement paste to chemically densify the surface of the concrete. See also: Liquid densifiers & hardeners. A concrete floor finish for new or old concrete surfaces obtained through intensive diamond grinding, liquid hardener densification of the concrete surface and final diamond polishing to Class A, B, or C and Level 1, 2 or 3.